Ever longed for a garden of your own? Wished you could grow some veggies during the summer but think you just don’t have the space? Forget growing out… you need to grow up! Vertical gardening is all the rage for small-space dwellers, particularly apartment renters who want to try out their green thumb when the weather is warm. Not sure where to start? Read on. Check out your local classified section or Craigslist to see if anyone is getting rid of shelving or a sturdy chest of drawers – both can make an attractive planter when fitted with some landscaping material. Better yet, most of the time they’re free as long as you’re willing to collect them. Take a look at your recycling. One of the hot new trends is to build your vertical garden out of old plastic bottles, or even wine bottles. With just a little soil and some sturdy rope or wire, you can easily build a garden. Get friendly with your local home improvement store. 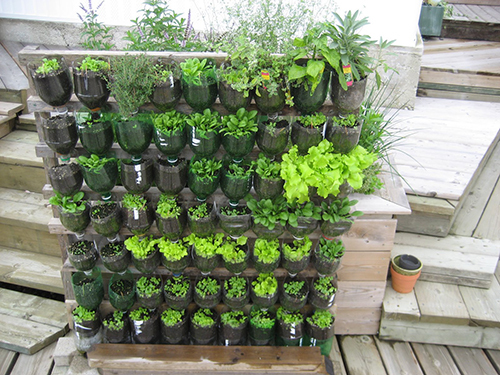 They often have pallets can easily become a vertical garden with just a little effort. Try using things you might not have ever considered as a planter. For example, laundry baskets! Not all plants were made to go vertical, but you’d be surprised how many can. From flowers to vegetables to herbs, there are a range of choices depending on what you want to achieve. For adding a splash of color to your home, look for ferns like Boston, Staghorn or English Ivy. Waxflowers, Petunias and Verbena also feel right at home growing vertically. When it comes to veggies, try hardy plants or cut and come again salad varieties; think spinach, lettuce, chilies or scallions. A vertical herb garden serves a dual purpose: you benefit from the greening of your walls, while your meals taste fresher and better. Fresh herbs are a great way to impress dinner guests. Dirt is dirt, right? Wrong. Buying the right kind of soil for what you want to do can help your plants grow, retain more moisture and even provide vital nutrients so you get the most bang for your buck with your plants. Also, growing great plants in a vertical garden is more than just tossing some soil into your planter – you also need to get your initial set-up right. Start by adding a layer of gravel or rocks at the bottom of your planter to give your plants appropriate drainage, then lightly add the soil on top. It’s also a good idea to let the soil rest for a few days prior to putting in your plants. Find out more about what kind of soil you should look at here. One way new gardeners tend to screw up is to forget to water their plants, or water them at the wrong time. To give the maximum benefit for your plants, water them thoroughly on a daily basis, or at least every other day. This is particularly important when it’s a hot summer, as plants can dry out fairly quickly. Also, only water your plants in the evening or very early morning – watering in the full sun can result in burns on your leaves and most of the water evaporating due to heat.